Porcelain dental crowns restore a damaged or traumatized tooth by placing a hard protective cap over the entire tooth to the gum line. A crown may be recommended for you by the West Hollywood porcelain dental crown dentist if your tooth cannot be repaired through dental fillings, inlays, onlays or other more conservative treatments. If you are missing teeth, a porcelain dental crown may also be used to replace those teeth for a more complete smile. Who is a good candidate for porcelain dental crowns? Porcelain dental crowns may be right for you if you have had a root canal on the affected tooth, have a large dental filling, broke your tooth, have an implant or are getting a bridge that is supported by crowns. 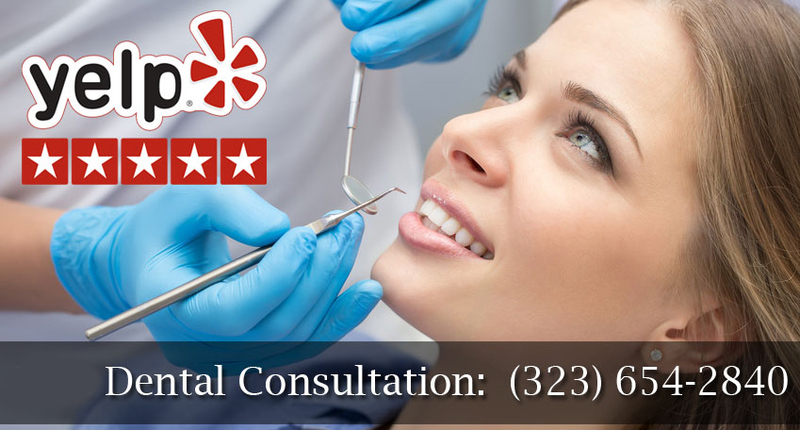 The West Hollywood dentist Dr. Bruce Vafa will consult with you about your treatment options after conducting a thorough visual exam. Dr. Vafa may also take dental X-rays or other imaging to see inside and beneath the tooth. Crowns sometimes require a root canal first, to protect the tooth and reduce risk of complications. The American Dental Association informs patients and professionals that crowns serve several purposes. 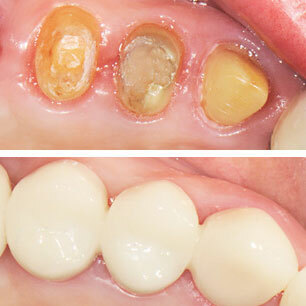 They cover teeth that are discolored or misshapen, prevent fracture of a weak tooth or repair a broken tooth. Dental implants may also be covered with crowns. While each type of dental crown has its own benefits and drawbacks, porcelain is often the best choice for a healthy, bright smile. This is because porcelain dental crowns appear like normal teeth, providing the visual balance to complete your smile, while not being detected as an artificial addition to your mouth. In West Hollywood and other regions where appearance is considered highly important, having porcelain crowns can boost your confidence while protecting and strengthening your smile. If you are seeking a healthy, virtually invisible surface replacement for your teeth, your dentist will likely recommend opting for porcelain crowns, over other types. Your smile will be flawless and no one but you and your West Hollywood cosmetic dentist will know that your damaged natural tooth is covered by a porcelain crown. When you visit with Dr. Vafa at West Hollywood Holistic and Cosmetic Dental Care for your porcelain crowns, he will explain the complete process of crown placement to you. You will know what to expect and have options for helping you go through your treatment in a relaxed, comfortable state. The area around your tooth being treated will be numbed so you can go through the treatment without feeling anything. You will remain comfortable and relaxed while the dentist trims some of the enamel from your tooth's surface. This will shape the tooth to hold the porcelain crown. Dental impressions will be made for the crown to be custom shaped for your tooth. The impressions are sent to a specialized dentistry lab that crafts your new crown. Until this process is completed, you will be fitted with a temporary crown. Your new porcelain custom-crafted crown will be received in a matter of days by the dental office. You will then come in for a second appointment, during which your new porcelain crown will be permanently bonded onto your tooth. Once that is completed you can go back to daily life and regular dental care. You will need to brush and floss regularly, as always. Just because you have a porcelain crown on top of your tooth, your natural tooth can still become decayed if you do not maintain your dental care regimen. If you have bruxism and grind your teeth at night, your holistic dentist may provide you with a mouth guard for nighttime wear. This will protect the porcelain crown from being fractured or worn down from the grinding. If you are ready to update your smile, repair damaged teeth or learn more about dental crowns, schedule an appointment with the West Hollywood Holistic and Cosmetic Dental Care dentist.